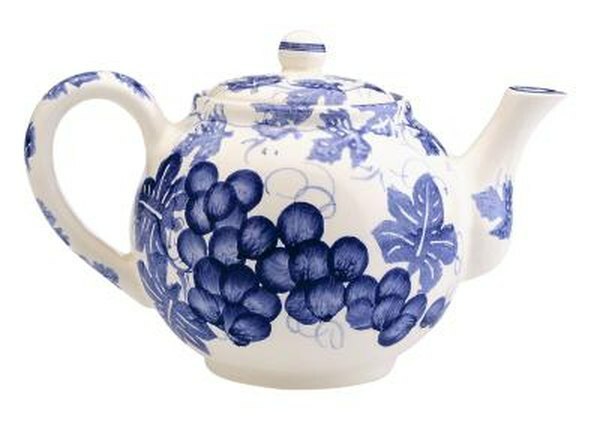 Blueberries act as a natural sweetener in both herbal tea and in flavored, caffeinated tea. There are many health benefits associated with blueberries. Some can be traced directly to the vitamins and nutrients found in blueberries, such as vitamin C and vitamin K. They are also a healthy alternative to refined sugar or artificial sweeteners, so you may find that your blueberry tea has no need of additional sweetening with unhealthy alternatives. According to findings published in the journal "Free Radical Biology & Medicine," there are several benefits inherent in blueberries. Among them, a high level of antioxidant anthocyanins indicates that they provide some significant protection against heart disease and damage from free radicals. They also help to protect the brain from oxidative stress, and the phenolic compounds in blueberries may also inhibit cell proliferation in colon cancer. Blueberries alone are low in saturated fat, cholesterol and sodium. They are also a good source of dietary fiber, vitamins A and C, potassium and folate. While these benefits are notable on their own, additional benefits are had by adding blueberries to various types of tea. Many teas contain flavonoids, caffeine and fluoride. Some studies associate these properties present a modest decrease in the risk of heart attack and a lower occurrence of kidney stones and cavities. Tea consumption has also been positively associated with bone density, and the stimulant effects of caffeine may increase your awareness and cognitive abilities for a short time. However, caffeine can also have unpleasant side effects. Blueberries contain antioxidant phytonutrients called anthocyanidins, which can combat damage to the collagen matrix of cells due to free radicals. Caffeinated teas, which include black, green and white tea, add their own antioxidant properties to those of blueberries. Combining blueberries with black tea adds polyphenol compounds such as catechins, which are associated with the removal of built-up toxins from your body. Green or white tea, which are processed without the fermentation common to black tea processing, contain a higher dose of these antioxidants. While the National Cancer Institute does not endorse the use of tea as a means of reducing cancer risk, the organization also does not argue against it, stating that while the antioxidant properties of tea are clear, their specific effects on cancer have yet to be proved conclusively in clinical tests. Black, green and white tea that is flavored with blueberries contains caffeine, and heavy caffeine consumption can result in insomnia, nervousness, upset stomach, muscle tremors and fast heartburn in some individuals. If you experience unpleasant side effects from caffeine, you may consider herbal blueberry tea instead. The ingredients in any given herbal tea vary greatly, and are usually comprised of herbs, flowers and other plants. Because there are no set list of ingredients needed to create herbal tea, no comprehensive list of benefits or effects can be applied to all herbal teas in general. However, the benefits associated with consumption of blueberries can safely be assumed when consuming herbal tea made with them. So, if you wish to avoid black, green or white tea while still benefiting from blueberry tea, seek an herbal blueberry tea and enjoy.